As seen in Columbia Spy August 21. Boys? I think there are two female officers. Yes, Officer Holly and Officer Amy. 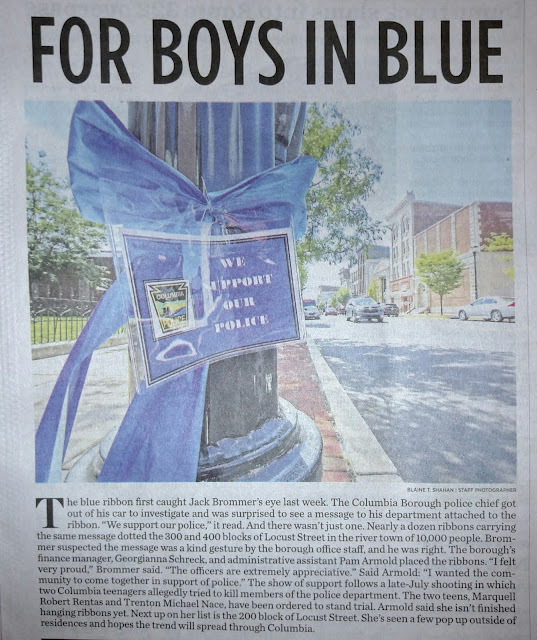 Pam, "you go girl" Thanks for doing this to show appreciation for the sometimes thankless job our dedicated Columbia Police do everyday for the residents of Columbia Borough. Would it be nice if residents put ribbons on their homes like they when our high school teams decorate the homes in Crimson and gold to support our athletes.